Conch Bar Village as seen from Big Hill, Middle Caicos. 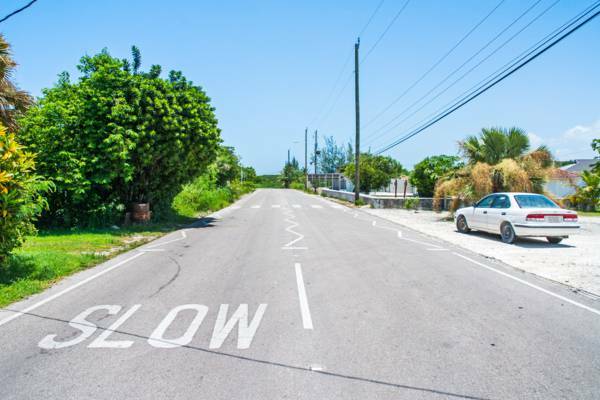 The main road through Conch Bar Village, Middle Caicos. Along with Bambarra and Lorimers, Conch Bar is one of three settlements on Middle Caicos. The largest settlement on Middle Caicos and the first encountered when crossing over from North Caicos by the causeway, Conch Bar boasts a population of around 100, a school, several churches, Daniel's Café and the defunct Middle Caicos Airport (MDS). Found close by is the attraction of Conch Bar Caves. There's not a large amount to see in Conch Bar, however, we recommend stopping by the Middle Caicos Co-op next to Daniel's Café to see the island's best gift shop. It's also worth the short hike to climb the bluff, Big Hill, directly to the west of the village. 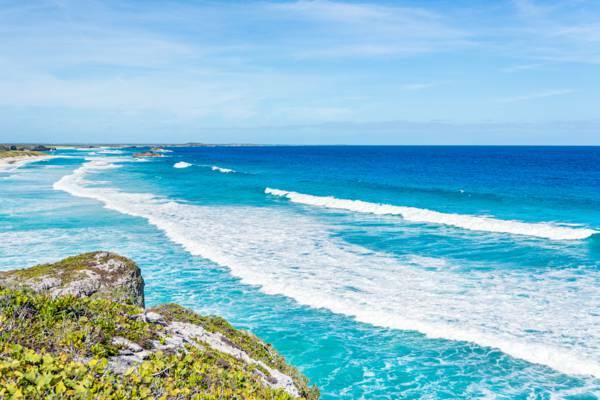 Here, excellent panoramic views are had over most of the island and over the Caicos barrier reef. Although largely forgotten today, several Loyalist-era plantations once operated in the Conch Bar Region. The stone shells of two such sites, Stubbs’s Plantation and Ferguson Plantation, still remain hidden in the dense coastal vegetation. Cotton and sisal (a fibrous agave raised for rope production) were the primary crops grown and remnants of these original plants can be seen throughout the area. The view over Mudjin Harbour from Big Hill at Conch Bar.